오는 10월21일 토요일 4시 시카고 다운타운에 위치한 포에트리재단(Poetry Foundation; 61 W. Superior St., Chicago, IL, 60654) 본부 강의실에서 <Music Inspired by Korean Poetry: Sijo in the Settings of Classical to Hip-Hop> 행사가 진행 될 예정입니다. 클래식과 재즈, 힙합곡으로 재 해석된 우리 고유의 시 형태인 시조를 소개하고 감상하는 음악회와 리셉션이 진행될 본 행사는, 주시카고총영사관 후원 하에 세종문화회(회장 오유심)의 주관으로 개최됩니다. 많은 관심 부탁 드리겠습니다. 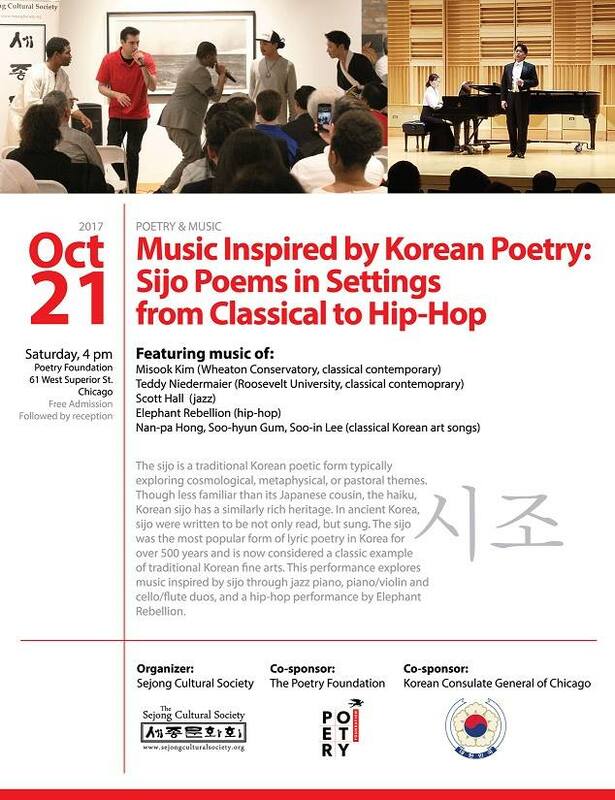 The Sejong Cultural Society is hosting a concert called "Music Inspired by Korean Poetry: Sijo in the Settings of Classical to Hip-Hop” on Saturday, October 21, 2017, at Poetry Foundation(61 W. Superior St., Chicago, IL, 60654) at 4 p.m.. At the concert, the musicians in various fields will present their new interpretation on Sijo, a traditional Korean poetic form. Please come and enjoy Sijo in Classical, jazz, and hip-hop music. Free Admission.